The Itsukushima Shinto Shrine is a traditional Shinto religious centre set as an artistic creation in its natural environment. Since ages, the island is known as a holy place for Shintoism. The first shrines were probably built there in the 6th century. The current one dates from the 13th century. The orange color of the wooden building contrasts beautifully with the green mountains and the blue sea. Most famous part of the shrine is the so-called floating Torii, the photogenic orange-colored gateway which stands in the water in front of the shrine. The island is not bad itself, except for the numerous souvenirshops. One day I will go back and explore the island further on foot. Hopefully, this time the sun will shine and the Torii will be looking as good as it does on the pictures. I visited this WHS in November 2009. This island is considered to be a holy place of Shintoism which combines nature and human creativity. The highlight of my visit was the huge Torii Gate. I had the opportunity to visit it by boat and also by walk when the tide retreated. This is definitely one of Japan's top WHS. I love this island! There is a certain atmosphere there that made me feel really comfortable despite the crowds. I wish I could have stayed a night on the island but it was fully booked everywhere. It was a public holiday. My experience at the temple was immensely enhanced by the unexpected appearance of a Japanese couple, all decked in traditional Japanese costumes, who held their wedding there. I could not believe my luck! I do think that it is obligatory to climb up Mt Misen. It was tough and I got something of a near death experience thanks to my unfit body but I thought the view from the top was gorgeous. There is a ropeway though, but I only used it to get down. I was stationed at MCAS Iwakuni from 1969-1971. Miyajima was always one of my favorite places to visit on weekends. A group of us would bicycle from Iwakuni, to Hiroshima, or just to Miyajimaguchi and catch the ferry. I don't know if it is still there, but at the time there was a "dragon" ferry that looked a lot like a viking ship. We would bicycle the length of the island. I have been fortunate to see the world thanks to the military. 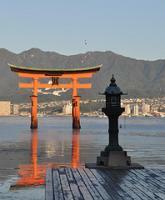 Miyajima and especially the Itsukushima shrine an torii will always hold a special place in my heart. I loved my tour in Japan. The Japanese were such gracious hosts. I virtually lived on Yakisoba, and still make it to this day. This place was spectacular the day I came to Miyajima, the sun was brightly accompanying the cloudless sky to create the perfect atmosphere for sightseeing and tourism. The torii shone in the sunset as the sun leapt over the mountainous horizon. I visited Japan in 2005 and visited Miyajima island. It was one of my favorite sites and we traveled most of the country. In Sept 2008, my brother married in this shrine and the experience was AMAZING. Our side was American and hers was traditional Japanese. They were so inviting. Being a part of such a time honored tradition was something that not many "westerners" get to experience. If any can make it to Miyajima island I would say go for it. It was was of the biggest highlights of my Japan experience! For Japanese, the floating Torii gate of Itsukushima Shrine on Miyashima Island is one of the great three sights in Japan. The shrine is became the symbol of Japan for many foreign tourists apart from Kinkakuji in Kyoto. Itsukushima Shrine is not the most important Shinto shrine but it is maybe one of the most beautiful. The complex is built on the mud shore which looks horrible when the tide is low, but when the tide is high the magic happen as the shrine is appeared to float above the sea. The famous Torii gate is just amazing as it is in the middle of the sea making a perfect entrance to the whole island. The history of the shrine is also interesting; the shrine was built in 6th century for the goddess of the sea who Japanese believe to be a daughter of the sun goddess who created Japan. The shrine became a favorite shrine of Taira clan, one of the most powerful families in ancient Japan. This clan declared Miyashima as a holy island and not allowed people to birth or die on the island in order to keep the purity of the holy land. The shrine was rebuilt many times but always in the old design. Miyashima is very near to Hiroshima. From Hiroshima you can use train or tram to the small town called Miyashimaguchi and then catch one of many ferries cross the small channel to the island. From ferry terminal, turn right to the shrine or just follow the crowd. My Trip to Itsukushima can be called gourmet tour more than cultural tour! When my Japanese friends and I had arrived Miyashimaguchi, we directly went to one restaurant in front of the train station to eat famous local grilled fish (after a really long queue), after we saw the shrine it was a time to sample famous local delicacy “Momiji-manju” some kind of assorted cake in the shape of maple leaf. As we did not know what shop is the best so we just bought from every shop we saw and sampled them!! After we returned to Hiroshima it’s time for Yakisoba or Japanese fried noodle, another specialties in this region. A trip to Itsukushima really made me full. The weather was so bad I could hardly see in anything! It was low tide and the Torii was mud-bound as well! The shrine itself is quite austere, but is beautifully built. The monks were also rather unfriendly, which was disappointing. This site is worth visiting if you are in the Hiroshima area, but not as the sole purpose of a trip. Visited the "floating torii" the weekend of June 19-20, 2004. This place was beautiful and fun. 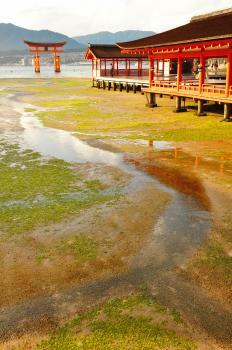 Located on the island of Miyajima and just situated for a love scene. From the wild-tamed deer to the many traditional Japanese wedding ceremonies being conducted added more romance to the shrine. A most definate and now I can see why it is considered 1/3 most beautifulest places to visit in Japan. For as long as I can remember I have had a fascination with Japan. 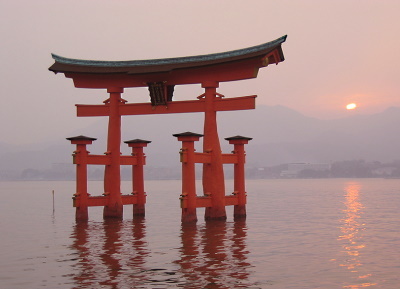 I still don't know if it was the image of the Otorii (Great Gate), guarding the entrance to the Itsukushima shrine that made me impressed with Japan, or the the Otorii was 'just' the symbol of Japan for me. I always wanted to come here and visit. Anyway, I visited in October 2000 and from seeing the gate emerge from the mist to returning as dusk fell I thought it wonderful. A spiritual place. Notable Bridges: Soribashi Bridge, the oldest arched wooden bridge in Japan, can be used only by imperial messenger. Masks: Itsukushima's Shinto priest wears golden mask topped with dragon during the Shinto ritual dance. 176 Community Members have visited.